Storms. Fires. Insects. All can weaken a structure — and in some cases destroy it if it’s made of wood. 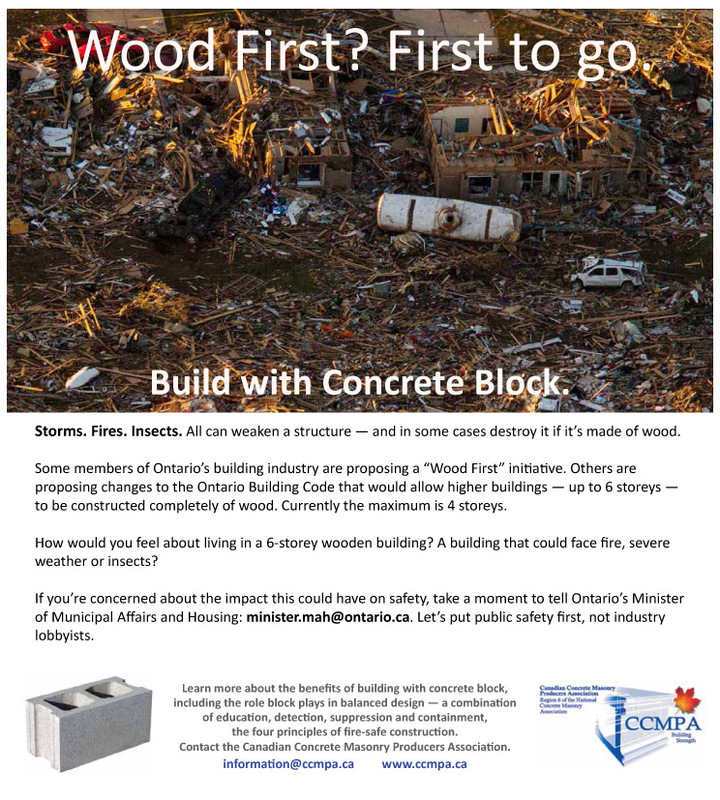 Some members of Ontario’s building industry are proposing a “Wood First” initiative. Others are proposing changes to the Ontario Building Code that would allow higher buildings — up to 6 storeys — to be constructed completely of wood. Currently the maximum is 4 storeys. How would you feel about living in a 6-storey wooden building? A building that could face fire, severe weather or insects? If you’re concerned about the impact this could have on safety, take a moment to tell Ontario’s Minister of Municipal Affairs and Housing: minister.mah@ontario.ca. Let’s put public safety first, not industry lobbyists. Learn more about the benefits of building with concrete block, including the role block plays in balanced design — a combination of education, detection, suppression and containment, the four principles of fire-safe construction. Contact the Canadian Concrete Masonry Producers Association.